Among Japanese special attack weapons that carried out suicide attacks near the end of World War II, some provided a slim chance for pilot survival such as when a kamikaze plane developed engine trouble and had to return to base or make a forced landing. However, a kaiten, a torpedo piloted by one man, resulted in certain death to the pilot once a submarine released it. Kaiten pilots in this well-researched novel express their feelings as they face death, but some of these views arise more from modern-day Japanese opinions toward war than actual kaiten pilot attitudes during the war. Deguchi no nai umi (Sea without exit), originally published in 1996, was completely revised for this 2004 book, which was the basis for a movie of the same name released in the last half of 2006. 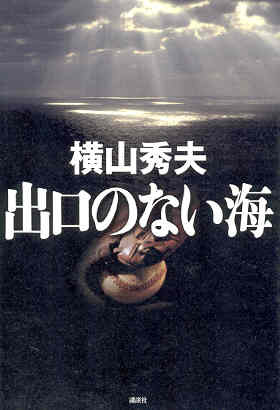 With the main character, Koji Namiki, being a pitcher for a university team, the discussion of baseball takes up a large portion of this novel. The author Hideo Yokoyama, who has written over ten novels, tries to connect Namiki's baseball involvement with his kaiten pilot activities, but in the end this relationship remains rather vague. The first third of the novel introduces the members and manager of the baseball team at A University in Tokyo from late 1941 to late 1943. Koji Namiki, the team's pitcher, was the winning pitcher at the national high school championship game three years before the start of the novel, but problems with his right elbow have meant that he has not achieved the same excellence during his university days. He constantly searches for a makyū, an unhittable pitch that literally means "magic pitch" in Japanese. He finally realizes that the way to throw a makyū would be to give two curves or changes to a single ball, but he continues to try without success to discover how to throw such a pitch. During this time he develops an interest in 16-year-old Minako Narumi, his sister's friend who he has known since childhood. The baseball team's blissful time together comes to an abrupt end with the government's abolishment of student draft deferment in September 1943. However, after the team disbands, Namiki successfully gathers together his prior teammates for one last game prior to their entry into the military. Despite the team's losing this final game, everyone immensely enjoys the experience and believes it will make a great memory. In December 1943, Namiki enters the Navy and gets assigned along with Satoshi Obata, former manager of A University's baseball team, to the Navy's Antisubmarine School in Kanagawa Prefecture. Obata struggles with the mental and physical demands at the school, and officers hit him so often for his mistakes that he tells Namiki that he wishes he could go quickly to the battlefront and die. When officers at the Antisubmarine School ask for volunteers to pilot a special weapon that will wipe out the enemy, Namiki indicates on the paper handed out that he desires to become a pilot for this special weapon and to take part in battle, but Obata does not. In an ironic twist of fate, Namiki finds out later that Obata died in the Philippines when three American torpedoes hit his transport ship even before Namiki finishes his training on the special weapon. Namiki finds out this weapon is the kaiten after he gets selected to join a group of 40 men from the Antisubmarine School to go to the Navy's torpedo boat training facility at Kawatana in Nagasaki Prefecture for a short period of special training. The romantic relationship between Namiki and Minako continues to grow as they exchange letters after he enters the Navy. After Namiki finishes training at Kawatana, he gets assigned to the kaiten training base at Hikari in Yamaguchi Prefecture. Katsuya Kita, a former member of the track team at A University, also has been assigned as a kaiten pilot at Hikari. Kita had been in training for the marathon at the 1940 Olympic Games in Tokyo until they were cancelled due to worsening relations between Japan and other countries at the time. During Namiki's first training run alone in a kaiten, he starts feeling panicky, veers off the intended course, and damages the kaiten. However, after that shaky first run, Namiki immerses himself in kaiten training and soon becomes a proficient pilot. As Namiki becomes engrossed in training, he fails to write to Minako despite her desperately wanting to know why she has received no letters from him. On March 1, 1945, Namiki gets assigned to a kaiten squadron of six who will sortie together from Hikari on a submarine carrying the weapons. He finds out that Kita will be his squadron leader and that Yasukichi Sakuma, who he has known since Antisubmarine School, will also be in his squadron. Hiroyuki Okita, Namiki's good friend since they first met at Hikari, gets assigned about the same time to a separate kaiten squadron. Okita, who along with Namiki grew up in the Koenji district of Tokyo, always has a cheerful smile and takes care of a dog named Kaiten on the base. Namiki gets a three-day leave to go home prior to his mission. Although he says nothing to his family about the kaiten, his family seems to guess his situation of being part of a special attack squadron since the media frequently has been mentioning the Navy's kamikaze special attack corps. Namiki decides not to see Minako during his short visit home since he does not know what he would say to her. However, she comes to the station just before his train leaves and clasps his hand through the window as the train starts moving slowly. Namiki's last words to her are "I, I love you Minako. But there no longer . . . ." The train whistle of the departing train drowns out the rest of his words. The kaiten squadron sorties from Hikari and heads toward the sea route between Okinawa and Ulithi soon after the American invasion of Okinawa began on April 1, 1945. A submarine chaser detects the submarine and drops several depth charges. The submarine narrowly escapes, but the depth charges damage two of the six kaiten strapped on top. The submarine then spots a large transport ship, so the pilots climb into the four undamaged kaiten. Namiki wonders which of the four will be selected to attack the lone ship. Orders are given to launch Kita's kaiten, but it does not move due to a mechanical problem. The same thing happens with the second kaiten. Then the kaiten piloted by Sakuma gets launched, and a loud explosion indicates the sinking of the enemy ship. Namiki, ready to be launched inside his kaiten, eagerly asks whether there are more enemy ships and shouts for the crew to search hard when he gets a negative reply. However, the three remaining kaiten pilots soon are ordered back inside the submarine. Kita, the squadron leader, soon comes to talk with Namiki, who now has the only functioning kaiten for enemy attacks. He pleads with Namiki to let him be the one to use the final kaiten or even to let him ride together in the kaiten with Namiki. Kita says that he as the squadron leader will live in disgrace if he does not die before the war ends, and for his entire life he will not be able to show his face in public to the kaiten corps, his squadron, or even in his hometown. Namiki refuses to give up his kaiten, and their discussion gets cut short by the captain's order to enter the remaining kaiten since a group of five enemy ships has been spotted. After Namiki prepares the kaiten for launching, he pulls out three photos from his breast pocket as he readies himself for death. The first shows smiling Minako. The second has the serious faces of his family. The last one shows the A University baseball team. But when the order comes to launch Namiki's kaiten, it does not move due to mechanical problems. The submarine returns to Hikari Base, and the next squadron to sortie from the base gets announced. The members include Namiki, Kita, and Namiki's friend Okita. Namiki tells Okita that it would be better for Japan to surrender now since the country will be completely destroyed soon due to overwhelming enemy forces. Okita asks why Namiki is going to his death if it is not to defend the country. Namiki responds that he will die so that he can tell the world of the existence of a weapon called the human torpedo. The next day Namiki goes on a kaiten practice run, but his kaiten is never located despite an extensive search. It's a strange feeling to write a letter to someone who perhaps has already sortied and died. But somehow I do not feel that you will read this letter. There is one thing I forgot to say in the music room. Okita, I liked your smiling face. I liked your never forgetting to be cheerful with whatever fate awaited you. But this is what I think. It would have been better to see your smiling face before the war. I would have wanted to talk more about things other than our squadron and special attacks. In the end I could not live with the purpose of dying. People need dreams to go on living. I could not live with the dream of dying. Therefore, this is not a last letter. It's a letter. If I again put on a bold front, you'd probably laugh. Don't worry. There's still oxygen. I have not abandoned hope. But is it day or night outside? I wonder what color the sky is now. These aren't the only things I'm concerned about. I want to see you again. Not with the kaiten squadron, but rather run into you in the streets of Koenji district in Tokyo. Okita, thanks for cheering weak me up all the time. Sorry for saying goodbye without telling you anything of the truth. I only have words of apology. But I dare to tell you a request. For a while could you become my double? I would like you to see the things I could not see. Such as the beauty of today's sunset. Such as the glittering of the summer sea. Such as the redness of a persimmon that has turned color. Such as the Koenji district streets covered in snow. I would like you to see these instead of me. After a year has passed of your seeing these beautiful things, I want you to forget about me. Please put me out of your mind. I would like you to find a good person and have overflowing happiness. I tell you many times that your happiness is my only concern. I want you to be happy. I would like you to promise that you will be happy. I want you to live, live, and again until you tire of hearing it, live. Be happy. Please be happy. After reading the letter, the thought of suicide crosses Minako's mind as she pulls out a poisonous powder distributed to her at the factory where she was working at the end of the war. A gust of wind blows away the powder on her palm, and there is a beautiful sunset that day that Namiki wanted to see. Although the novel overall accurately reflects the basic history of kaiten training and battle operations, a few aspects of the book lack historical realism. Namiki's parents barely get mentioned, even though most young men in those days had very close relationships with their mother. The relationship between Namiki and Minako feels more like a modern love story than one that existed in wartime Japan where many marriages were still arranged by parents although the couple generally had the final choice. Minako expresses her feelings of affection for Namiki very openly and directly, and she even gives him a senninbari (thousand-stitch belt) for protection when he enters the Navy even though during the war a mother or another female family member would have been the normal person to give such a gift. Many liberal arts students who entered the military in late 1943 had wide-ranging intellectual interests and achievements, but the university students depicted in this novel seem to have little other interest than playing baseball. Incredible coincidences fill this fictional work. Okita unbelievably finds Namiki's kaiten floating on the sea several months after it had been lost. Kita, who Namiki knew well at the university, just happens to be his kaiten squadron leader over a year after they both enter the Navy. Obata, manager of Namiki's baseball team, ends up right with him at Antisubmarine School. These coincidences, along with examples of lack of historical realism from the previous paragraph, result in parts of this book not being credible historical fiction. Namiki changes his attitude toward the kaiten a couple of times, but the reasons for these shifts remain unclear. The novel provides almost no information on his childhood background or his deeply held beliefs on any subject other than baseball. As a result, it comes as a surprise when without explanation Namiki suddenly immerses himself in kaiten training and ignores Minako's plea to write to her. Then after his failed mission he shifts back to doubting the value of the kaiten, but again the book provides no personal reasons for his sudden misgivings after having such conviction only a short time before. His opposition to continuing the war seems reasonable from today's perspective, but actual special attack corps members very rarely made such comments between themselves. Soon after the war's end, the surviving former players of the A University baseball team get together at a small restaurant they used to frequent. They discuss whether Namiki ever really discovered how to throw a makyū (magic pitch), and they conclude that until the very end even in the military he had the dream of pitching such a ball. This dream until the end of his life encourages the surviving team members to get back together and play baseball again. This meaning of makyū revealed at the novel's end seems rather contrived and shallow in comparison to a nobler goal such as sacrificing his life to defend his homeland and to protect his family and other loved ones. The kaiten pilots and other special attack corps members who actually sortied in World War II exhibited some of the same feeling and attitudes as those depicted by this novel's kaiten pilots. Most pilots anxiously wanted to sortie again if they returned alive from a special attack mission, and a great number of pilots who survived until the end of the war had feelings of depression and disorientation when they considered why they had survived when so many others they knew went to their death. However, open expressions of dissent against the war, such as Namiki's comments to Okita that it would be best for Japan to surrender, would hardly ever have been made between men assigned to a special attack squadron.